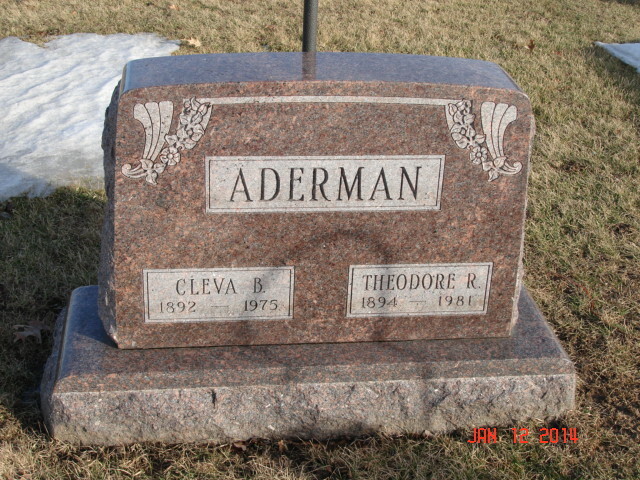 Today, 6 Jan 1981, my second great-uncle, Theodore “Tad” Rudolph August Aderman passed away in the Lutheran Hospital in Mesa, Arizona. Uncle Tad was the sixth of twelve children born to my paternal second-great-grandparents, Ferdinand and Mary (Heiden) Adermann. Born on 13 November 1894 in Altamont, Effingham County, Illinois, USA Tad lived much of his life in Effingham and nearby Logan Counties. He registered for the draft in both World War I and World War II. The 1930 and 1940 US Census’ list his occupation as a farmer “on his own account” in Mount Pulaski, Logan County, Illinois. He was a member of the Masonic Lodge, Eastern Star, and Mount Pulaski Christian Church. Cleava Brashear (1892 -1975) married Tad in Lincoln, Logan County, Illinois on 4 Feb 1915. By the time he was 26 years old, he experienced the death of four of his siblings (Magdalene Maria, Ida, Henry, and Mary). Tad and Cleava raised two daughters, Mildred and Betty, and in retirement, wintered in Mesa, Arizona. His obituary is below. My thanks to Kevin Hackett of Our Family Genealogies for some of this information.